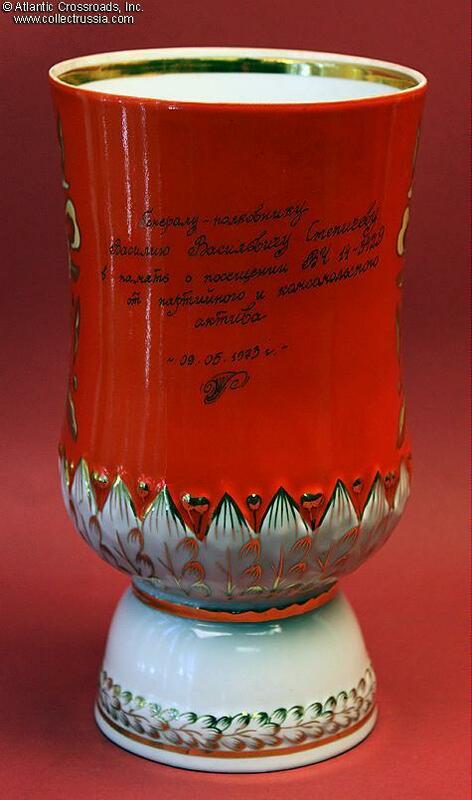 Large decorative porcelain Komsomol presentation vase named to Air Force Colonel-General Vasiliy Stepichev, Baranovka, 1973, excellent condition. 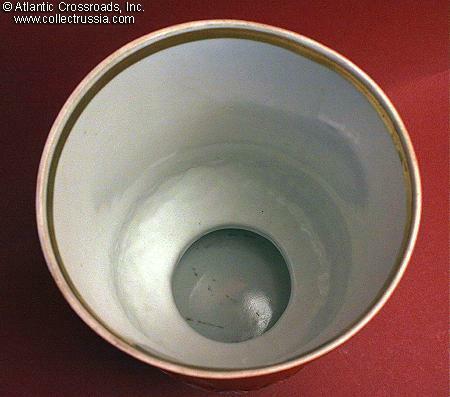 4 1/2" diameter base, 5 ¾" diameter at top, 10 ½" tall. 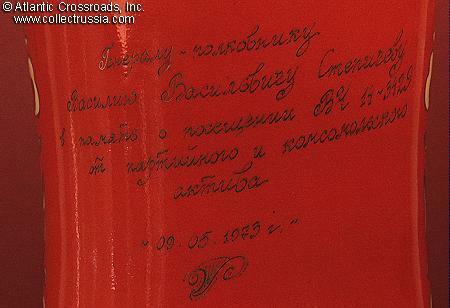 Shows Komosomol Badge with Lenin's profile, floral and laurel leaf decoration, hand inscribed dedication in gold that reads: "To Colonel-General Vasiliy Stepichev in memory of the visit of military unit 14-3429 from the Communist Party and Komsomol". 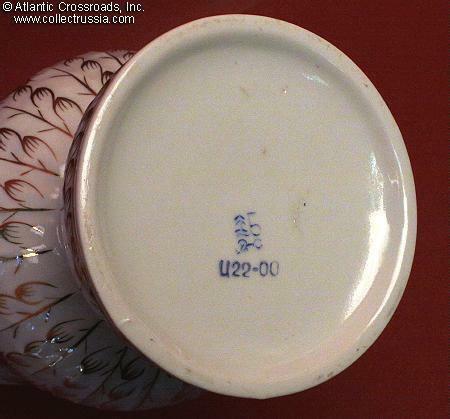 Shows 22 ruble price and the maker mark of the Baranovskiy Porcelain Factory (in the town of Baranovka, Zhitomir Region, Ukraine). 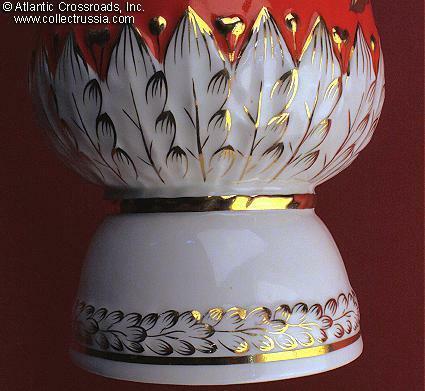 As is typical of most Soviet era china cups and vases, the lip above the gold trim has a matte, bisque-like finish. 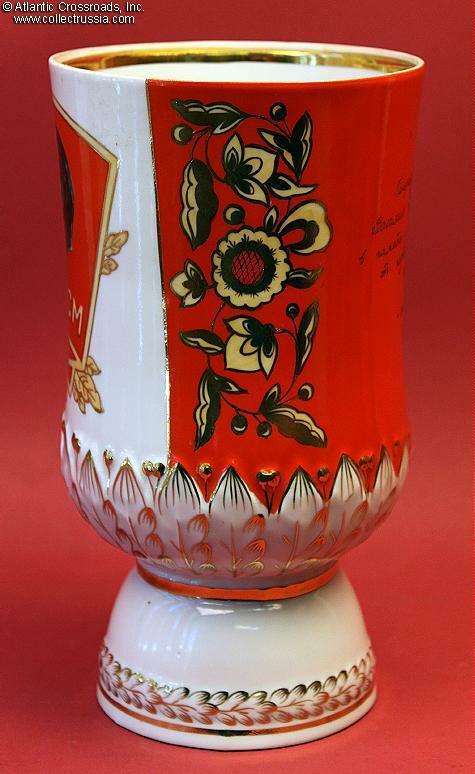 In excellent overall condition; the colors are nice and bright. 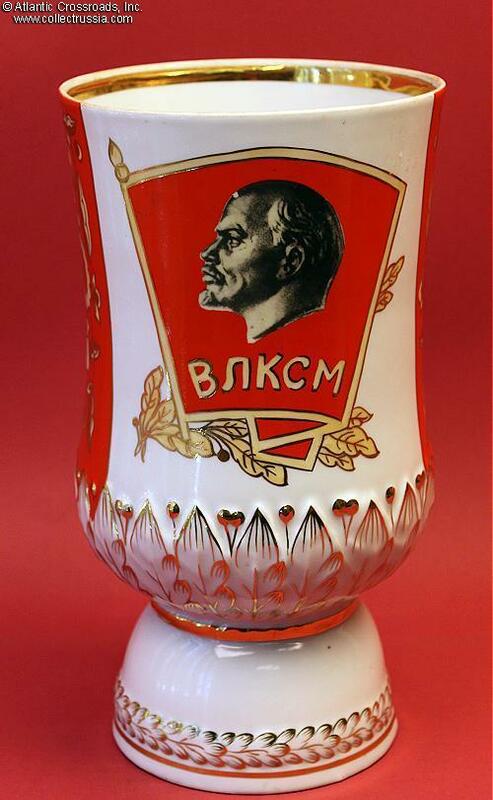 Tiny white spot on Lenin's forehead (a factory imperfection, not a chip) could probably be safely rendered invisible by lightly touched with a small dot of watercolor paint. 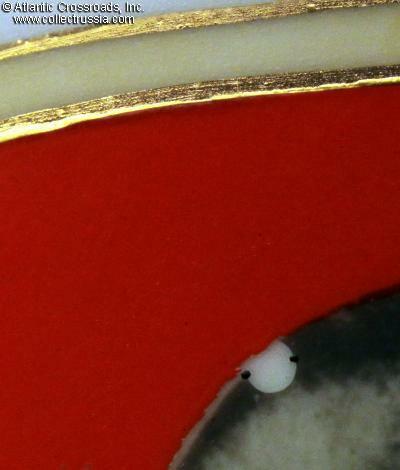 The thin matte area at the lip shows minor dirt - not detractive and probably cleanable with a good detergent. Vasiliy Stepichev (1903 - 1982) was a Soviet Air Force Colonel-General. In the early 1930s, he commanded the 4th Light Bomber Aviation Squadron. In 1942, he commanded the 228th Aviation Assault Division and later that year went on to command the II Aviation Assault Corps. In 1944-45, he commanded the III Guards Aviation Assault Corps. 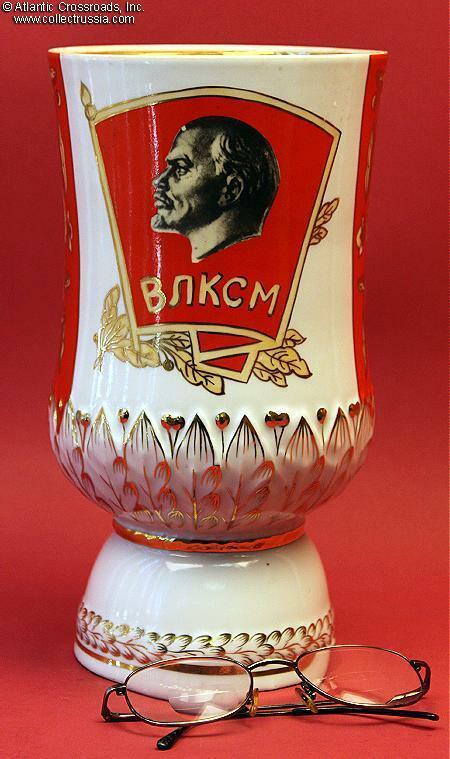 His most significant postwar command was that of the 57th Air Army from 1951-55.In the Soviet Union in the early 1970s, twenty-two rubles was a very hefty price to pay. It is an indication of the significance that the local authorities attached to the General's visit. 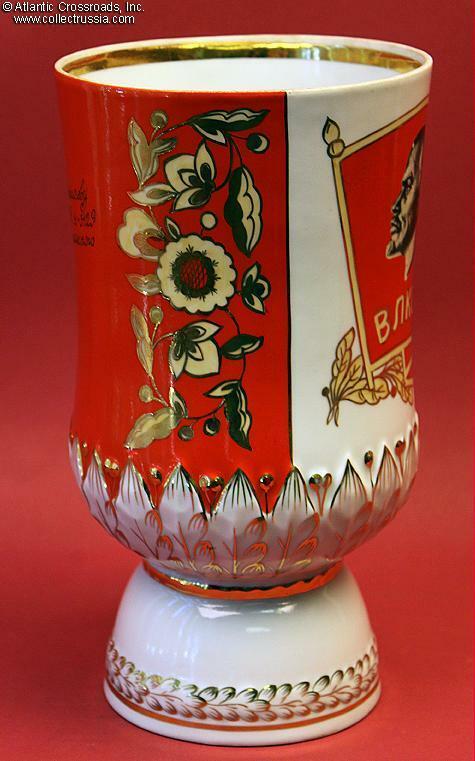 A very impressive vase, one of the few we've seen that is capable of making a dramatic statement - whether or not it is ever filled with flowers!